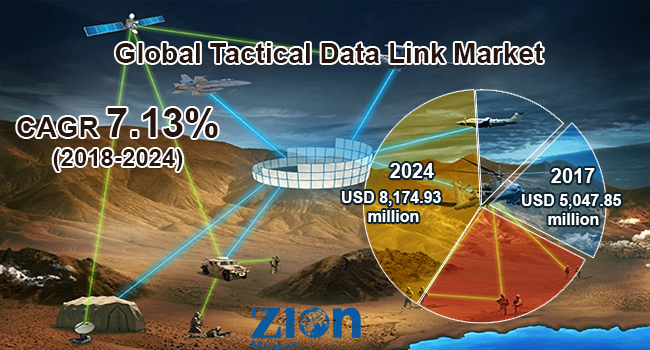 Global tactical data link market expected to reach USD 8,174.93 million by 2024, growing at a CAGR of around 7.13% between 2018 and 2024. Tactical data links are open up situation awareness in the combat zone. Homeland security such as coast guard has many advantages from interoperability with supporting military armed forces. The report covers forecast and analysis for the tactical data link market on a global and regional level. The study provides historic data of 2015-2017 along with a forecast from 2018 to 2024 based on revenue (USD Million). The study includes drivers and restraints for the tactical data link market along with the impact they have on the demand over the forecast period. Additionally, the report includes the study of opportunities available in the tactical data link market on a global level. This report offers comprehensive coverage of global tactical data link market along with, market trends, drivers, and restraints of the tactical data link market. This report included a detailed competitive scenario and the product portfolio of key vendors. To understand the competitive landscape in the market, an analysis of Porter’s Five Forces model for the tactical data link market has also been included. The study encompasses a market attractiveness analysis, wherein all segments are benchmarked based on their market size, growth rate, and general attractiveness. This report is prepared using data sourced from in-house databases, secondary and primary research team of industry experts. The study provides a decisive view of the tactical data link market by segmenting the market based on platform, components, application, and regions. All the segments have been analyzed based on present and future trends and the market is estimated from 2018 to 2024. By platform, the market is segmented into air-based, land-based, sea-based, and weapon-Based. By components, the global tactical data link market is segmented into hardware and software. Components wise, the market is bifurcated into intelligence, surveillance, & reconnaissance (ISR), radio communication, command and control (C2), and electronic warfare (EW). The regional segmentation includes the current and forecast demand for North America, Europe, Asia Pacific, Latin America, and the Middle East and Africa with its further bifurcation into major countries including the U.S., France, UK, Germany, China, India, Japan, and Brazil. Key participants operating in the global tactical data link market includes Northrop Grumman, Rockwell Collins, L3 Technologies, Raytheon, ViaSat, Leonardo, BAE Systems, General Dynamics, and Saab AB (Sweden) amongst others.